ELIZABETH CITY, NC - General Motors has not been cheap when it comes to the amount of news the automotive company has been releasing in regards to the 2016 Chevy Volt. This includes a lower price ($33,995 which is $1,175 cheaper than the 2015 model) and specifications on the upgraded Voltec drivetrain. However one thing Volt enthusiasts have been anxious about is the official EPA MPG and MPGe numbers. After digging around, we might have found out that those official numbers might be higher than originally anticipated. After searching through the GM-Volt forum, it was noticed that under fuel economy, the numbers were changed from 41 MPG as quoted by GM to 43 MPG. This in turn brings the MPGe ratings (using combined electric driving range and gas engine) all the way up to 106 MPGe, compared to the 37 MPG and 98 MPGe for the current 2015 Volt. Although this is not necessarily set in stone, it is so exciting that the 2016 Chevy Volt could get 43 MPG and a 106MPGe! It looks like the total driving range has gone from 420 miles to 430, then back down to 420 miles. GM does not plan to release the official fuel economy numbers until sometime next month, even though you can make a deposit to GM to reserve your 2016 Volt in early adopter states like California. 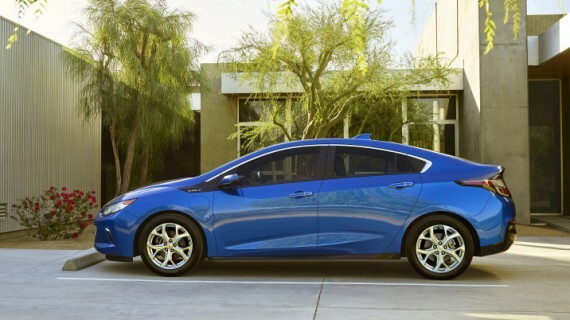 Just the fact that the 2016 Chevy Volt could get 43 MPG and a 106MPGe, is thrilling to say the least! You can bet, however, that Perry Auto Group will have all the latest news and updates regarding the 2016 Chevy Volt, and you could always stop by and take a test drive in our current 2015 models. Perry Auto Group has two dealership locations to serve you better at 1005 W. Ehringhaus St, Elizabeth City, NC, 27909 or 1001 Halstead Blvd Elizabeth City, NC 27909. Feel free to call us with any questions at (252) 338-9100.